All our service options include a thorough cleaning of all the flooring in your home, including vacuuming. Using a top of the line vacuum, our professionals will tackle, carpets, hardwoods, tile, stairs, hallways, and furniture. Using various attachments including an electric power brush for carpets and our hardwood suction brush we can efficiently vacuum all the nooks and crannies in your flooring. Why vacuum instead of sweeping your hardwoods and tiles? Have you ever had trouble getting all the dirt dust and debris into your dustpan? We find vacuuming more efficient and reliable in terms of reducing the overall amount of debris left on your floors. Ultimately this affects the results you get from mopping as well. Instead of spreading around anything left behind by the broom, we can actually work on removing any built-up residue and film on your flooring. Our top of the lie Miele vacuum uses a powerhead roller brush attachment the not only provides suction and brushing action but also vibrates the carpet fibers to loosen and lift debris. During our deep clean service, our cleaners also edge your carpets. 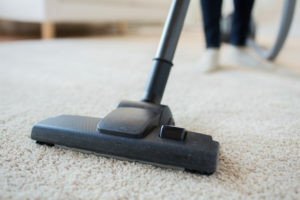 Using a small wand we follow the edge of the carpet around the room and your furniture to lift debris which collects towards the seams of your carpet. Using a specially designed suction brush with a swivel head our vacuum easily slides under furniture to collect all the dust bunnies hiding in your home. Maneuverability allows us to gently access hard to reach corners in around obstacles. When was the last time you looked under your couch cushions? Never? Well, Clean Arrival LLC Portland Vacuuming Services have you covered yet again. Our trained professionals will gently and expertly vacuum your couch, chairs, and sofas for you. Top to bottom, we’ll refresh your furnishing.